Home / Features / New BMW 5-series upgrades: less weight, more tech and… the same clothes. New BMW 5-series upgrades: less weight, more tech and… the same clothes. New 5-series upgrades from business to first. It’s the Mk7 so, fittingly, it’s nicked the best bits of 7-series. So, less weight, more tech and… the same clothes. 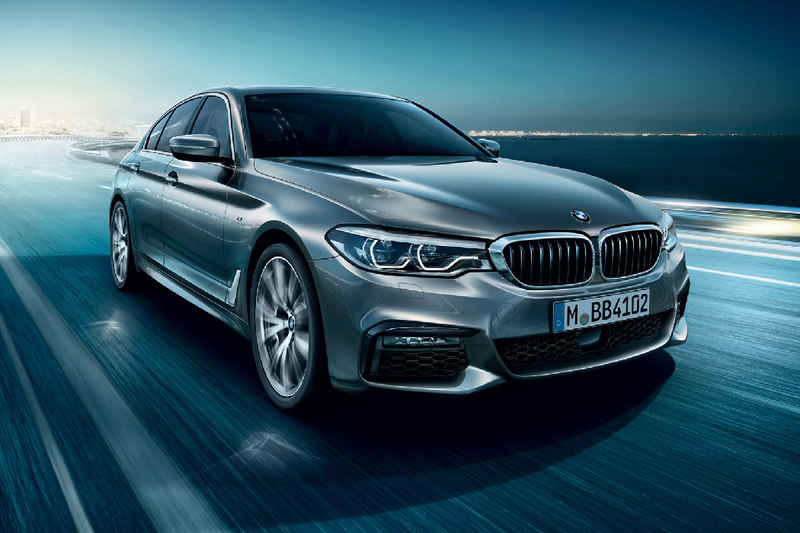 Your next 5-SERIES will be lighter, more aero-dynamic and bring the latest generation of BMW’s high-tech features to the masses (or masses of executives, at least), including self-parking and car-to-car communication for the first time. What it will not do, however, is amaze you with its cutting edge looks. Seldom can such a radical light have been hidden under such a conservative bushel. They will talk of evolution, of a cab-rear look and subtle creasing as well as details such as the full-width headlights and ‘air breathers’ shared with the bigger 7-series. But the subtext is clear: the G30 5-series is the 7-series in tighter trousers. A shame to waste all that brilliance on a handful of CEOs, the odd EU leader and savvy auction predators in a year’s time. Careful aero work has cut the 5-series’s drag factor by 10% to just 0.22 Cd, with underbody changes and the adoption of active air flaps behind the kidney grilles for low-demand situations. The G30’s structure mixes aluminium, magnesium and high strength steels to deliver weight savings of up to 100kg depending on the model, with body strength and torsional rigidity up, although it does without the Seven’s expensive carbon core. The bonnet, roof, bootlid and doors are aluminium, the latter weighing a little over 6kg each, while the magnesium support for the instrument panel saves 2kg over the previous steel item. More weight has been shaved from the running gear, with integration of the electronic parking brake into the rear callipers cutting a further 2kg. BMW even claims a 500g saving from using the natural fibre kenaf for the lining of the bootlid enough to offset the weight of a typical owner’s wristwatch. Height and wheelbase have increased by just 10mm in total but the new 5-series is 32mm wider and 36mm longer, giving marginal improvements in the cabin; headroom is increased front and rear, rear legroom is up 10mm and the boot now offers 10 liters more space to give 530 in total (still 10 less than the E-class). BMW also claims increased comfort in the rear with door pockets able to hold one-liter bottles (of what?) and a rear bench that can accommodate three child seats. A stack of new engines will appear, with the petrols featuring twin-scroll turbos and diesels bringing higher-pressure common rail fuel-injection with improvements in performance and fuel economy across the board. The 530i will use a 2.0-litre four-cylinder unit to give 249bhp and 258lb ft, cutting CO2 emissions by 11% to just 126g/km and achieving 52.3mpg. The forthcoming 520d ED will also deliver a remarkable set of figures: 0-62mph in 7.5sec yet 72.4mpg and 102g/km. A 530e iPerformance PHEV arrives in March, promising improved performance in EV mode; a top speed of 87mph and up to 28 miles range. Topping the range until the M5 arrives late next year will be the M550i xDrive, using an uprated version of the 4.4-litre V8 providing 456bhp, 479lb ft of torque and 0-62mph in just 4.0 seconds, thanks to four-wheel drive, available on F 5-series for the first time. BMW claims xDrive is more sophisticated than key rivals’ as it can switch 100% of the drive to the front or rear wheels from a default distribution of 40/60 front to rear. The new 5 is groaning with the latest electronic driver aids and semi-autonomous systems. Integral Active Steering is now electromechanical and incorporates rear-wheel steer, as well as being compatible with xDrive for the first time. The active roll stabilisation now switches to electrical activation for faster responses, while sat-nav data can be used to tweak the steering, damper control and transmission. Go for the Driving Assist Plus package and your 5-series will change lanes for you at up to 112mph, steer round obstacles in an emergency and correct accidental lane departure even at 130mph. All 5-series models get BMW’s Professional Media system as standard, which means a 10.25-inch display incorporating both touch control for the first time and the latest generation of iDrive with gesture control available as an option. The latest update of BMW’s Connected Drive app will also bring a series of new features including the Personal Mobility Companion and Car-to-X, which allows BMWs to communicate with each other and data hubs to share traffic, accident and weather information, another step towards automated driving. And then there’s parking. Clearly this must be high on the bugbear list for BMW owners as the 5 has four systems dedicated to the berthing business. Remote Control Parking (as on the 7), upgraded Parking Assistant, Park Now (which allows you to locate and book spaces in advance), and On-Street Parking Information, using RTTI data to predict the likelihood of finding a space at the side of the road.